Technology has found its way into the tape measure, one of the most basic of tools. A tape measure is a vital tool for professional contractors and homeowners alike. Now you can use the benefits of technology to help you get the accurate measurements that you need and want every time. There are many options available and the best way to start is to know your needs. How often do you use a measuring tape? What features are going to make using it easier? Is digital really right for you? Our reviews should help you narrow down your search for the perfect measuring tape. The eTape16 ET16.75-db-RP Digital Tape Measure (eTape) is the latest in measuring technology designed with the homeowner or contractor in mind. The eTape is a well thought out tool that is loaded with features to make using it easy, functional, and fun. Basic use is simple and easy to follow. Pull out the blade as you would a traditional measuring tape and the readouts are automatically displayed and move along as the blade is lengthened. The eTape eliminates counting tick marks on the blade, making your chances for error smaller. It has a standard blade lock to hold the tape in place when necessary. Taking this feature to the next level is a digital hold button that keeps the reading on the digital display in place until you are ready to continue. Another time saving feature is the mid-point button. Measure your space on the wall, push the mid-point button located on the side, and the eTape calculates the center/middle of the measurement. The mid-point is then shown on the digital display. Dividing boards, locating the center of a room, and hanging pictures on the wall become easy, simple and fast, with no calculations needed. As a tool that is used in a shop or garage, a tape measure is going to get bumped, tossed, and dropped. There may also be a need to use it in inclement weather. The e Tape case is designed with all of these possibilities and uses in mind with a weather-resistant poly carbonate plastic outer case that also gives it a sleek modern design. Because it is a highly technical tool, you will need to be more careful with this measuring tape than a traditional tape. A crisp, clear large digital readout displays all the important information that you need to take accurate measurements. The display is located on the top of the tape measure for easy reading during use. Easily read feet and inches, meters and centimeters, and fractions and decimals. Any tool that can give you accuracy and save you time is worth the price. Converting from inches to centimeters and sometimes back again, can take up valuable time. A conversion button on the side of the tape measure allows you to switch back and forth between standard and metric as many times as you need. You don’t have to convert any of your measurements as it can be done for you with the click of a button. Users reported the measurement conversion feature is their favorite aspect of this tape measure. Measuring tapes are often needed in hard to reach places or in awkward positions. The usual solution is to bend the tape to get into those difficult spaces. But the eTape has an inside/outside button, located on the side, that allows measurements to be taken from the front or back of the tape measure. When measuring a ceiling corner, with a simple click of a button, switch to the back measure function which prevents the need to bend the tape, which can often cause you to lose hold on the other end. Switching between front and back measuring is simple and fast. You can do it one handed if need be, saving you time. There is an arrow indicator on the digital display that lets you know whether you are taking the measurement from the front or the back of the tape measure. Writing accurate measurements is the key to being able to complete projects. Many people find that they forget the measurement once they pick up their pencil to write it down. The eTape addresses this issue with two small memory buttons located next to the display. Simply take the measurement, push the memory button, push it again when you are ready to write the measurement down, and the last reading will show up on the display. This time saving feature can keep your measurements accurate and save you frustration from having to measure twice. Users found the digital display could be off by approximately 1/16 of an inch or more once in a while, which caused them to measure more than once. If you are going to be using a measuring tape for highly specific calculations like making stairs or a bookcase you will need to measure more than once to be sure you are getting an accurate reading or consider a traditional measuring tape. The eTape hash a 90 day warranty for defects in materials or workmanship and measures a maximum of 16 feet. 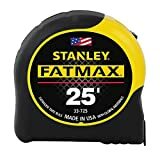 The Stanley 33-725 25-Feet FatMax Tape Measure (FatMax) is a tough traditional measuring tape that has proven its worth time and time again. It is a contractor favorite for its rugged durability. Mylar coats the entire length of the blade to extend the life of the tape measure. It can withstand use in heavy construction and contract work where the blade may be pulled in and out many times each day causing abrasion along the blade. The Mylar also helps to protect the blade from being smashed or bent. The first six feet of the FatMax is reinforced with Blade Armor, an industrial thermoplastic coating. This technology has great strength and durability that can be seen not only on this tape measure, but also on rotor blades and other aircraft parts, giving this first six feet of the tape measure blade staying power in the rough construction industry. But the durability extends beyond just this first six feet. There is an 11 foot standout, aided by 1 1/4in width for measuring ease. Users reported this was their favorite and most used feature of the FatMax, especially those who worked alone on a regular basis. Twenty-five foot length gives you greater versatility in what you can measure, making it applicable to a wider variety of jobs. However, others found the extra 1/4in width added unwanted extra weight. If you are looking for a lightweight tape measure this is not the right one for you. Solid construction is a great strength of this tape measure. The cushioned grip gives superior hold to help prevent it from slipping out of your hand during use. The case is made of a heavy plastic that resists dropping, falling, or smashing. Together this gives you non-slip grip with quality impact resistance. A top forward lock holds the tape in place to allow for accurate measurements and ease in standout measures. This lock is designed for one-handed operation, however, in practice, many users found unlocking the blade was difficult and required two hands. A dense, heat-treated spring recoils the blade quickly. The solid construction of the spring means the recoil mechanism isn’t going to fall apart, a common issue with tape measures. The FatMax was designed with construction and contract work in mind. To help in frame work there are 16in. and 19.2in center stud markings, taking out any guess work during building. With a top and bottom hook on the end of the blade, you’ll be able to grip better while measuring. A belt clip helps keep the tape measure with you at all times to help prevent losing it. The belt clip has a strong grip that did damage the clothing of some users. 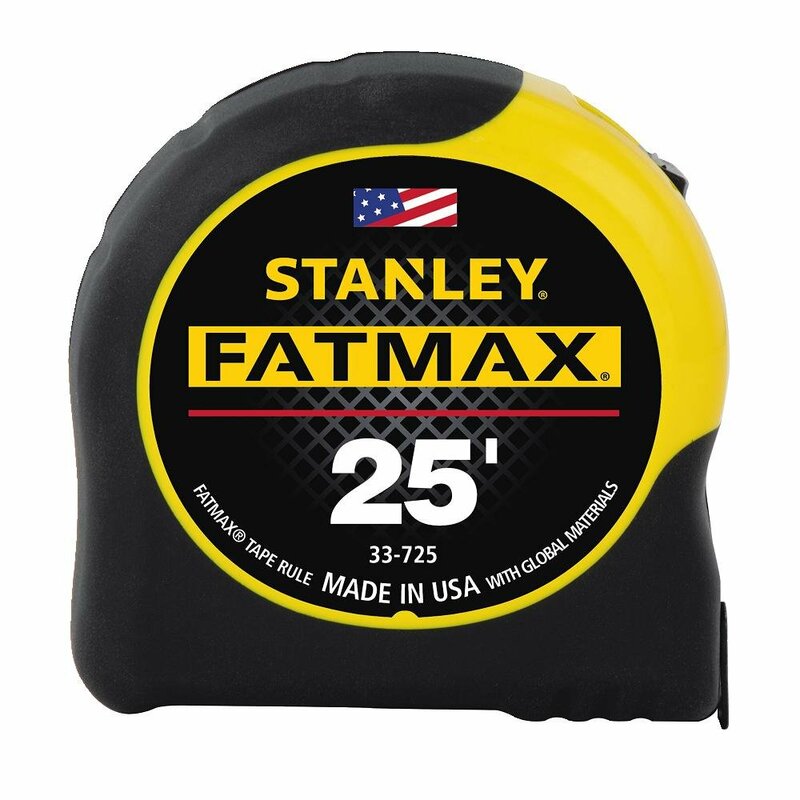 Overall the FatMax is a high quality tape measure with the rugged durability needed for heavy use. It comes with a limited lifetime warranty. 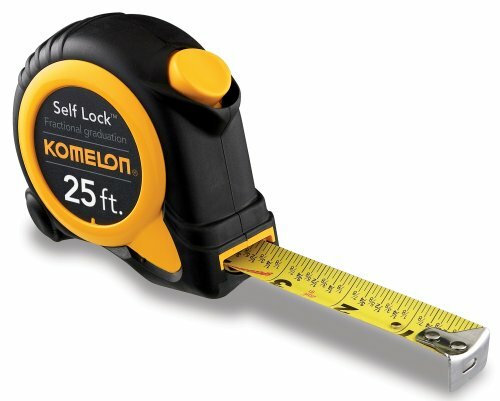 The Komelon SL2925 Self Lock Speed Mark 25-Foot Power Tape (Komelon) is a traditional measuring tape that is lightweight for ease of use. For those who need a lightweight tape measure, the Komelon only weighs 1lbs., with good accuracy and simple features, the Komelon can provide what you need. A nylon coated blade adds extra durability that will give homeowners the kind of lasting power they are looking for. While this isn’t as reinforced as the previously reviewed tape measure, it would work well for home use and light construction work, especially if size and weight are an important consideration. The Komelon boasts a self-locking mechanism found on all tape measures in the Speed Mark series. The tape does not retract automatically, it locks as the tape is extended. A release button on the top of the tape measure releases the lock, but once you let go of the button it locks again. Many users state this is their favorite feature of the Komelon. It took some users extra time to get used to this feature, but once they did, they reported that measuring while alone was easier with the self-locking mechanism. The blade is well made with a matte finish. It is marked up to an 1/8in., with the fractions being printed at each mark. Users liked this because they did not have to count the tick marks to get an accurate measurement. There are tick marks for the 1/16in. markings but they do not have the number visibly marked on the blade. With large arrows indicating feet, red highlights every 16 inches, and arrows marking 19.2in there are adequate markings to help in construction work. Red caution labels mark the last foot for a quick reminder of how close you are to the end. The hook on the end of the blade is reinforced and riveted at the bottom of the tape. There is a good amount of movement back and forth to accommodate both inside and outside measurements. A lightweight plastic and gripping material makes up the case. The gripping material also helps protect the case from falls, drops, and smashes. Users reported they liked the lightweight design for ease of use and that the grip held firm in their hand. Despite its lightweight construction, many users found it withstands fairly heavy use without damage. Komelon does have a warranty but does not specify the time period. You must have a valid receipt to get coverage. They also have a very detailed document available on their website that specifies what is covered under the warranty, complete with explanatory pictures. The Stanley 33-425 Powerlock 25-Foot by 1-Inch Measuring Tape (Powerlock) is a traditional measuring tape meant for frequent home use. This is a classically designed tape measure that has all the basics. Recent changes in design have prolonged the life of this useful, yet economical tool. A heat- treated spring extends the overall life of the tape measure. Much of the wear and tear on a tape measure comes from retracting. With this spring, the tape measure will stand up to frequent use for an extended period of time. Longevity is increased with Mylar coated blade. The Mylar protects the blade from the abrasion that results with prolonged use. With this Mylar coating, the tape can withstand construction and contractor use. The Powerlock has a Tru-Zero hook at the end of the blade. This hook can be used as a pivot for drawing circles and arcs. It can also be adjusted to take inside or outside measurements. This works by allowing for a small amount of movement at the hook so that when you take an inside measurement, like inside an entertainment center, the zero point is the front end of the hook. Alternatively, when you are measuring the outside, the back of the hook becomes the zero point. A lock mechanism secures the blade in place during use, which makes taking measurements easier. Once finished, the blade can be unlocked using one hand for convenient use. The 1in. wide blade is clearly marked with 16in. and 19.2in stud center markings for framework. Markings are in two different colors to allow for easier reading. A belt clip allows the Powerlock to go with you, hands free, for easy portability. It is small and lightweight so it won’t take up precious space in a drawer or toolbox. With its small size and convenient features, this tape measure provides adequate durability for the price. While this review is for the 25ft. 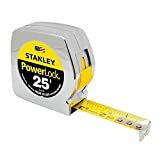 tape measure, the Powerlock also comes in 12ft. and 16ft lengths to meet all user needs. Stanley provides a limited lifetime warranty. There is no doubt that tape measures take abuse in their regular everyday use. The blade movement in and out causes a high degree of abrasion. Look for a tape measure that has some kind of protective coating like Mylar or nylon to prevent this abrasion from eroding the blade. All this extension and retracting is hard on the spring mechanism as well. Check reviews before you purchase. If users are finding that the tape won’t retract after a short time, keep looking. The spring has to be made of a high quality material that will withstand frequent use. The case is also creates a durability issue. Like many tools, tape measures are going to be frequently dropped, shoved in a drawer, or smashed under a seat in a truck or construction materials. The case needs to be made to with stand the rigors of regular use. Easy to read measurement markings are important for accurate results. Some tapes have numbers along with tick marks for easy reading, while others may only have the tick marks. This means you are going to have to count the marks and probably recount the marks to make sure you have counted correctly. Tapes with numbers on them are going to be easier and faster to read. Digital measuring tapes also make reading easier as they display the measurement as the blade is pulled out. However, be aware that these tapes may be off by up to 1/16in on their digital display. If you do highly detailed work you may want to stay with a traditional measuring tape on which you can check the marks yourself. The hook is small, but can make a big difference in the usability of the tape measure. Tape measures with hooks that are too small will slip off the end of a board when you pull them. There are some hooks that come with grip features to give better hold, but having an adequately sized hook is more important. Also look for a hook that up as well as down. This gives you greater flexibility when measuring above your head or gripping from underneath. Hooks that adjust according whether you are measuring inside or outside make it so that you do not need to adjust your calculations for length. Think about what you normally use a tape measure for. Are you measuring to hang pictures in your home? Or are you measuring boards to frame a house? Construction and contract workers are going to need longer, heavier duty tape measures that a home owner. If you are a homeowner that measures only occasionally, a shorter, lightweight tape measurer will do. Also keep in mind how the tape measure feels in your hand. One that is too large may be highly durable, but hard to hold on to while working, making its durability of little importance. 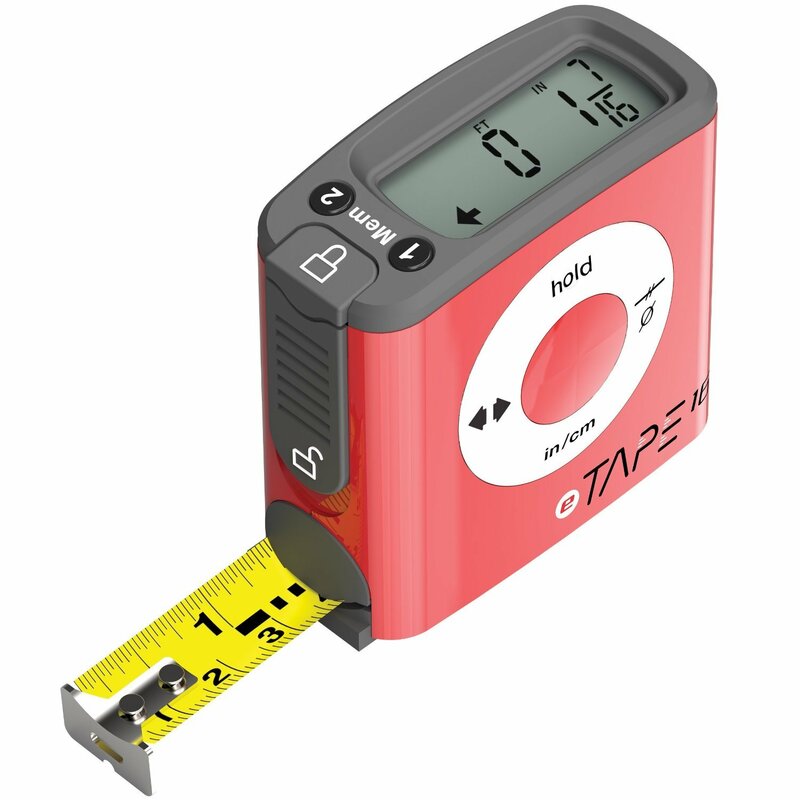 Advancing technology has led to the tape measure becoming a digitalized tool that can record measurements, find mid-points, and convert from standard to metric all with a simple button click. Before buying digital, know your needs. If the features included on a digital tape measure would benefit you and you use a measuring tape often, then it is a good buy. But if you rarely use a tape measure, paying for a digital won’t help as much. Learning how to use it properly may take you more time than to use a standard tape measure. Because of its electronic mechanisms, a digital tape measure can break more easily. There are simply more parts that can be damaged during regular use. A heavy duty standard tape measure may be work better for someone that doesn’t want to worry about breaking a digital. Tape measures have come a long way. There are more features to consider now more than ever. Keep in mind how often and how you plan to use it. This will be the greatest determining factor in the finding the right tool for you. Quality tape measures can be found in any price range. Know the features you are looking for and you can narrow down your search quickly.